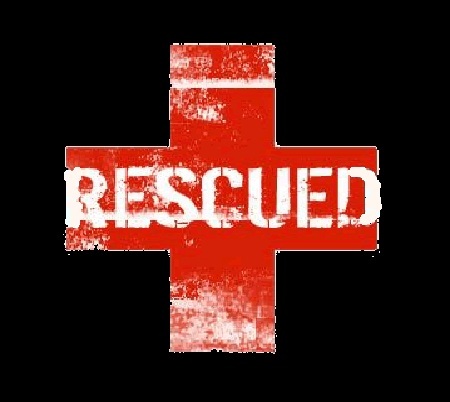 This week I was rescued. I know some of you follow me on social media so you know I have been and am extremely sick. Particularly Sunday through Tuesday I was some of the sickest I’ve ever been in my adult life. I couldn’t breathe fully, was coughing non-stop, very congested (went through a box and half of tissues in that time), wheezy breathing, body aches and lots of awfulness. You might not know because I am so public and bold but I actually lead a fairly lonely life. Most of that is my choice. I work alone and I am unmarried. Most of my good friends have moved away from me and so I rely on book clubs and other monthly events for socializing and real-world contact. The Summer is better because I meet friends for swims quite a bit. Anyway, my family doesn’t live by me either except for some cousins and my Grandma. My parents are moving here which will be nice and my brother was going to school for Fall/Winter but for the most part I am alone. Normally I am fine being alone but when I get sick it is tough. It is especially so when I am this sick. It was painful to breathe let alone cook, clean, drive or do anything else. So I was pretty miserable (as my twitter followers can attest to!). Finally Tuesday morning I had slept about 2 hours in 3 days and I hit my low. I called my Mom and sobbed but it was the weird halting coughing sob where she couldn’t understand a thing I said. I told her I wished I could fly her out to take care of me. For once in my life I needed help. I couldn’t do it alone any more. I was just kind of venting but I really was at a genuine low place. However, I’m a pretty independent person so I think she knew it was pretty bad. To my shock a few hours later she texted me ‘I got a plane ticket. I will be there 7:30 tonight”. I couldn’t believe it! She was coming to rescue me. She wouldn’t normally be able to do such a thing (she still has a child at home and is in the middle of a move and is Relief Society President at church) but it just happened where it could work out. I’ll never forget this thing she has done. I can promise you that. When I’m old and feeble and she’s long gone I will talk about the time my Mother flew across 4 states at a moments notice to rescue me. It really is true. I am not someone who has a ton of love in my life. I do not have a great partner or spouse. I have never really been romantically in love. And I have no children to understand that love. I understand friendship and treasure those relationships but it feels good to know I’m a girl who is loved by her Mother. Loved enough to come and rescue me. It made a big difference too. I went and saw the doctors in the morning, which I wouldn’t have done because I went to urgent care on Sunday. They did blood-work and an x-ray because they were concerned about the wheezing. He gave me a steroid that has helped a lot with the coughing and a new antibiotic. The difference between today and Tuesday is huge. Sure the medical care is nice but I think the love helped too. I’ll keep you guys posted on how my recovery is going. Hopefully I don’t have pnemonia or something like that. I am also soooo thankful to my boss for being wonderful through all this. I am incredibly blessed woman. I hope you all feel loved and when you are in need of rescue someone is there. Sure love ya!